The sun is shining, I just dropped off Mrs. T. and our daughters at the airport (visiting her sister), and I am ready for a late Friday lunch. I am a fan of Calvin Trillin’s writing, and I’ve always been inspired to do his suggested meal tour, a literal moveable feast. You go from place to place and sample a dish at each, much like the Spanish tapas scene. First stop: Ellana’s Kitchen, which has both Venezuelan and Middle Eastern food. I spotted it on Yelp and have never been. As mentioned, the key to the food tour is to order one small dish. An appetizer, perhaps, or a side dish. Off the bat, I failed and failed miserably. I over-ordered. Fortunately, I have good reasons. First, I’m a fan of empanadas, ever since a Venezuelan friend served some to me. It has been a lonely quest to repeat that peak experience. Given my existential longing for empanadas, I had to order one as soon as I saw the menu. I successfully resisted the urge to order two. 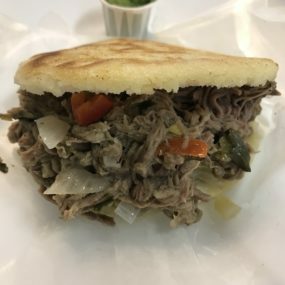 But, then, I chatted with the friendly proprietor and learned that their beef arepa is extremely popular and also is gluten free. Both were incredible. Run, don’t walk, to Ellana’s. Just go. Now, a food tour with one stop is a lame food tour. It lacks ambition. Granted, I was feeling decently full at this point, but to fulfill the concept of the “tour,” I walked down the block to the second stop: Little Big Diner. I know the menu, and this menu knows me. 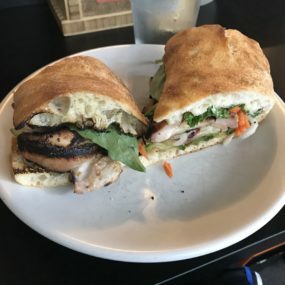 I wanted to try something new, and the shoyu chicken bánh mi just called my name. Plus, since I was below-budget on gluten, this seemed like a good call. Alas, it was good, not great. The bread was soggy, and the dish needed more flavor profiles. To be fair, I’ve had super-authentic bánh mi, and, so, I have a high bar. Plus, LBD doesn’t sell itself as an authentic Asian eatery. The ramen there is always excellent, however, and I will stick to that next time. Sadly, the tour ground to a halt at this point. I was hoping to hit Jumbo Seafood for har gow, which would be just four small dumplings. Or, maybe a touch of ice cream with chocolate sprinkles at JP Lick’s. But, the empanada-arepa-bánh mi combination proved to be formidable. I drove back a happy man. Next week is July 4, and although it will be quiet at home with just my son and I, I am looking forward to that holiday. The only question I have right now is: What’s for dinner? I like how you mentioned that the key to a food tour is ordering one small dish for each place, as it will let you sample more dishes. My friend is an absolute foodie, so I think she’d love to go on a food tour. Do you have tips for choosing the restaurants you’ll want as part of the tour? Regional density. Best to be able to walk to each establishment?